Cardiothoracic imaging techniques are those used to visualize the heart and surrounding structures. Examples of imaging techniques that are used to screen patients for particular diseases include echocardiography, nuclear imaging, and magnetic resonance imaging (MRI). In echocardiography, ultrasound waves are used to produce a 2-dimensional image of the heart. It is a very safe examination with no side-effects. It allows the physician to assess heart function. The test may be useful to diagnose a patient who has reported symptoms such as shortness of breath or chest pain. Echocardiography is also used to assess proper valve function and detect congenital heart defects in utero. Both standard echocardiography and Doppler echocardiography are used, depending on the information needed. In standard echocardiography, a black and white image is produced in real time that allows for an accurate assessment of chamber size and thickness. The size of each ventricle can also be calculated to diagnose myocardial hypertrophy, a heart enlargement that more commonly affects the left ventricle and occurs in diseases such as heart failure. The 2-dimensional moving picture of the heart also allows the assessment of cardiac valve function and the identification of congenital defects. In Doppler echocardiography, the physician can additionally assess blood flow, as illustrated by color flow mapping. 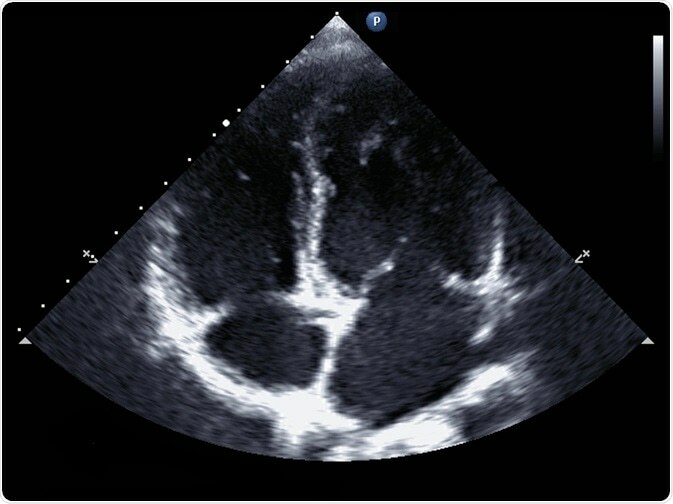 Doppler echocardiography is useful in detecting atrial or ventricular septal defects, in which the blood does not follow its usual route through the heart. The ribs often obstruct the view of the heart during electrocardiography. In such cases, a transesophageal echocardiography may be used. This procedure differs from the transthoracic echocardiography described above, in that a transducer is guided down the patient’s esophagus, nearer to the heart, to obtain a clearer picture. Finally, a stress echocardiogram may be recommended to assess the activity of coronary arteries. This type of echocardiography is performed immediately following physical exercise. Stress testing with echocardiography and nuclear perfusion techniques are the current standards of diagnosis for non-invasive assessment of ischemia. Nuclear imaging techniques are available to assess cardiac anatomy and function. In nuclear imaging, a radioactive substance is delivered to the myocardium, and the gamma rays released as part of radioactive decay are detected by external cameras. One type of nuclear imaging is that used in computerized tomography coronary angiography (CTCA). CTCA allows for the assessment of the arteries that supply blood to the cardiac muscle (coronary arteries). It is a non-invasive procedure but patients are exposed to radiation. In CTCA, a contrast solution containing radioactive iodine is injected into the coronary arteries ,and images are generated using X-ray beams. Cross-sectional thoracic images are taken from multiple angles and can therefore be used to create 3-dimensional pictures of the heart muscle and the coronary arteries that supply it. If any plaque build-up is present in the coronary arteries, it will be visible on the scans. Modern techniques also allow for the scans to be printed on film or using a 3D printer. In MRI, radio waves and high-strength magnets are used to produce images of the thorax. MRI uses no ionizing radiation. An MRI of the heart can provide comprehensive information about cardiac function, including an assessment of previous infarction. It shows clear images of soft tissues and is a standard tool to assess congenital cardiac and vascular disease. Cardiac MRI is gradually making its mark in the detection of ischemia as well, especially in patients with depressed ventricular function. Some specific forms of a cardiac MRI scan include cardiac viability MRI scans, which are particularly useful in identifying injured cardiac muscle (for example, following a heart attack), and stress perfusion MRI, which allows for the assessment of blood supply to the myocardium. MRIs cannot be used for patients with pacemakers (due to the strength of the magnetic field) and those patients allergic to the contrast medium or those who have had an adverse reaction to adenosine (used in stress perfusion MRI scans). Some recent advancements in imaging technologies available include new angiography systems, wireless ultrasound transducers, noiseless MRI, radiation dose monitoring solutions, and advanced technologies for producing 3D sculptures from 3D datasets.